LynchyRightNow: Keep It Real Friday! K-K-K-K-Keep It Real Friday! We're talking everything on this one, no introduction needed . . GET AFTER IT! "What a long strange trip it's been." -Grateful Dead Can you think of a better quote to describe the career of now veteran Dolphin running back, Ricky Williams? I can't. Playing in his 9th season since being drafted in 1999, Ricky Williams play this year has had me raising an eyebrow or two. On the road in Carolina Thursday night, Williams rushed for 119 yards and recorded two rushing touchdowns to go with one receiving. This was the type of night former Saints head coach Mike Ditka had dreamt of when he traded his entire NFL draft for the running back from Texas coming off a Heisman Trophy winning season. However, a career marred by substance abuse and subsequent suspensions never allowed us to accurately view just how good Williams is. Williams sat out the entire 2004 and 2006 seasons. Yet still he has nights like he did tonight, how many athletes could do that? 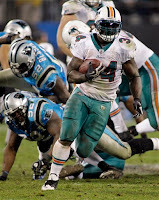 Currently, Ricky Williams sits 33rd on the all-time NFL rushing leaders list (8,329 yards), again he's played in just 109 games an average of 12 games a season. Miami's Wildcat offense which has swept both the NFL and college football scenes in the last 18 months, wouldn't have been possible without Ricky Williams. The pairing of the young Ronnie Brown & Ricky Williams a season ago, was dynamic enough to lead the Dolphins to an AFC East title. Ricky Williams isn't a role model, he may not love football, and yes we expected more out of his career, but at this point, over 10 years since being drafted, I'm finally starting to get his game, it's good. Ricky, tip of the cap, you were worth every draft pick Ditka traded you for (Just not for the Saints). Keep It Real! Quit Crying! To the parents and families of the Kansas Jayhawks football players, get over it! 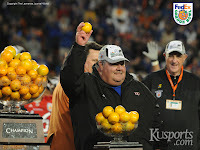 Current Kansas football coach and former NCAA Coach of The Year (2007), Mark Mangino, has been under fire this week from the NCAA and people within his own program. Apparently the players and parents alike are crying foul after Mangino allegedly scolded a player during practice for not paying attention and being focused. The player was laughing and joking while a team in the midst of a 6-week losing streak was going through a pre-game walkthrough. Three things come to mind: (1) This is division-1 big time college football, not pop warner. A coach is only as good as their previous season and if Mangino is frusterated with losing, then you, the player, must also be. He's coaching for his job every game, but you have school to fall back on! 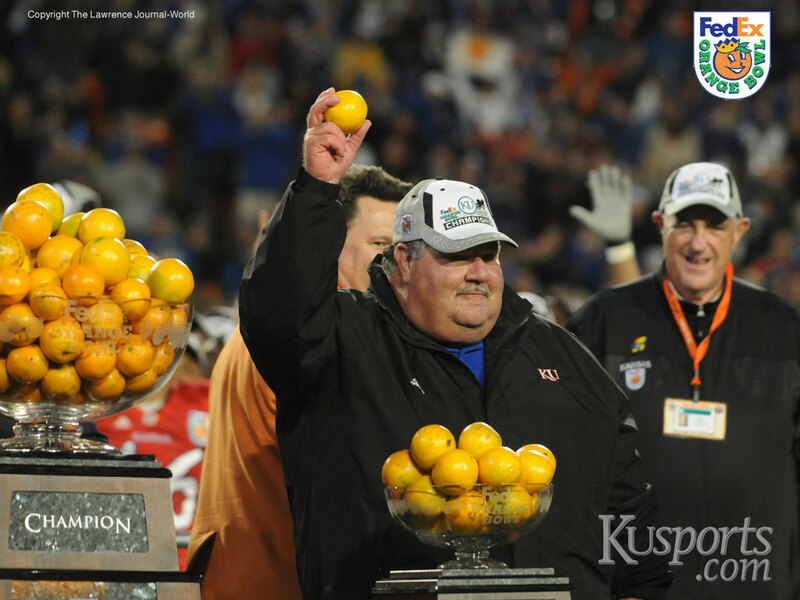 (2) Mangino is attempting to mold players into either professionals in football or into another profession, either way, that's his job. If you don't like his style, or what your kid got in trouble for, maybe you should tell your kid to find somewhere else to go, this is Mangino's way. Finally, (3) These are kids, not adults. They deserve to be treated as children would be treated. I've seen plenty of coaches do way worse than pointing a finger in my face, if you can't handle that, football isn't for you. If you can't pay attention and want to joke around, go back to your dorm room and flunk out in two semesters! Keep It Real! Mangino is in charge at Kansas, NOT YOUR MOM! The great mal-content. My new nickname for the player formerly known as The Answer, Allen Iverson. I loved watching A.I. for the longest time, he was the player every fan loved. Iverson could score 50 points on any night, in his prime other teams didn't have a chance. However, after 13 years in the NBA, I'm over Iverson. Since leaving Philadelphia in the '06-'07 season and heading for Denver, Iverson has manage to submarine almost every team he's played on. The Nuggets never played as well as they did until after Iverson was dealt in exchange for Chauncey Billups, a veteran point guard from a team environment. When added to Detroit, Iverson just became a bigger head ache and only added to the problems of the once prominent Pistons. 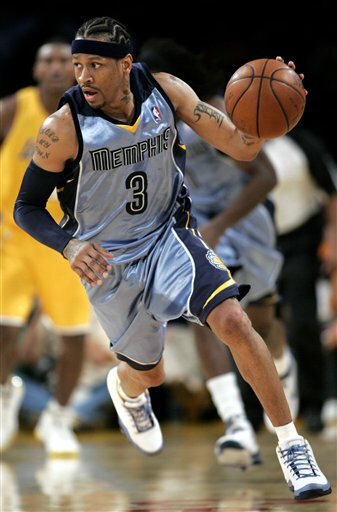 At the beginning of this season, Iverson signed on in Memphis, a place he should would leave faster than he came. A.I. was a great fit in Philadelphia when no one around him dared cross his path, he was a starter, he was THE scorer, and more importantly, it was his way. From the infamous 'practice speech' to his antics involving head coach Larry Brown, the Sixers were his. Now, Iverson is just looking for a team he can takeover for the remainder of his career, and that team may just be the New York Knicks. More power to you New York, it doesn't take a genius to see what has happened. Keep It Real Allen, just retire. If you say so. Last weekends Pacquiao v. Cotto fight smashed pay-per-view records recording 1.25 million buys. At $56 bucks a pop, 1.25 million buys brought in over $70,000,000 in domestic pay-per-view revenue. Aren't we supposed to be in the worst economic recession in decades? Weren't Americans supposed to be saving their money? Not when Manny Pacquiao enters the ring on fight night. You can keep waiting for a dominant American heavyweight, I'm signing on with Pacquiao. The pride of the Philippines dominated Miguel Cotto last Saturday night and smashed his way into the forefront. In less than twelve months, Manny Pacquiao has made himself into not just a Filipino icon, but a global icon. From making Oscar De La Hoya quit after 8 rounds back in December, to flat out destroying Britain's own Ricky Hatton in 2 rounds last spring, and finally putting a hurting on Miguel Cotto, has Pacquiao left any questions unanswered? No. With just Floyd "Money" Mayweather and his 40-0 record remaining, Manny Pacquiao is inching closer and closer to standing alone. America, general public included, get with it. Manny Pacquiao is a new breed of fighter and it's about time we all pay attetion, Keep It Real!